If you’ve never heard of Abdullah Alkhonaini before, let us do the honors. For the last nine years, he has been fighting for civil rights and an open government. He changed the game by compelling politicians to be more open about their work. It wouldn’t have been possible but for Raqib50, the project that Alkhonaini co-founded. “It was a kind of a snowball for Kuwait” said Alkhonaini. We helped to develop Raqib50, so we were elated to hear, that on the Human Rights Day (10 December), Alkhonaini’s outstanding work was recognized. He was awarded the French-German Prize for Human Rights and the Rule of Law. Among the fifteen people to receive the prize from all around the world, Alkhonaini was the only person from the Middle East. 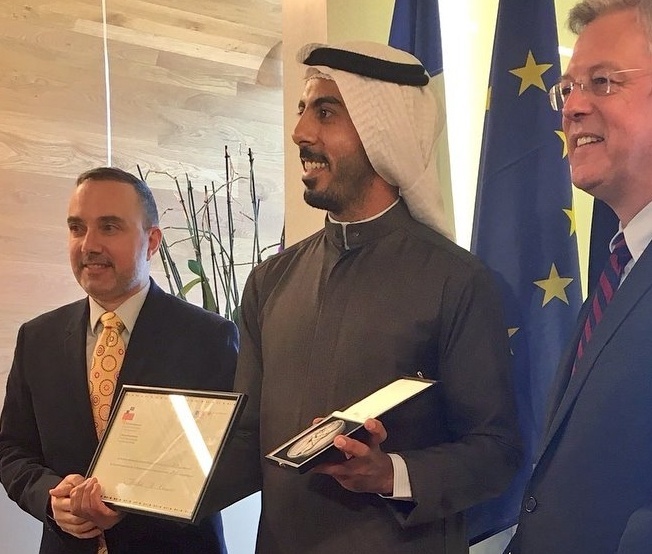 He was also the first Kuwaiti to have been recognised with the award. It all started in 2009, when Alkhonaini joined the non-profit organization Sout Al-Kuwait (Voice of Kuwait). Sout Al-Kuwait was outraged that the Parliament passed important laws that violated the constitution. “We started collecting data, researched regulations and gone through all voting registries. So in the end, we collected about nine major laws, that were in conflict with our constitution. We put it all together in a small book, adding some explanation: what’s wrong with the law and why. And we did one more thing. 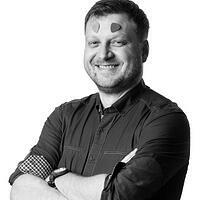 We put faces of politicians and showcased how they voted: ‘yes’, ‘no’, ‘abstain’”, Alkhonaini told Netguru. It was controversial at that time in Kuwait to have politicians listed in that way. But the idea clicked. The publication went viral, and everybody wanted to have a copy – it was circulated widely at universities, even at the Parliament itself. “It was a huge success. It raised a lot of discussion” said a member of Sout Al-Kuwait. Alkhonaini and his colleagues wanted to publish a second edition. “But then we thought: why don’t we expand to something bigger?” recalled Alkhonaini. 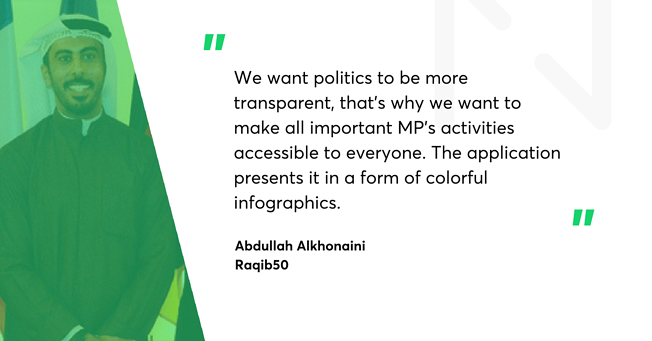 Rather than having a booklet with a limited audience, they decided to set up an online platform to monitor the parliament, keep track of ongoing legislative processes, and showcase all the votes. “We wanted people to be part of it. We wanted them to be the judges and track whether an MP they voted for acts in line or against their beliefs” added Alkhonaini. Another problem was that the Parliament in Kuwait lacked transparency. A lot of information was public but it wasn’t easily accessible. “People just voted, but they didn’t follow up on their MPs. Occasionally, they would read some articles in newspapers, but that was it. And we changed that” said Alkhonaini. They changed the Kuwaiti parliamentary landscape by launching a project called Raqib50. Raqib in Arabic translates to ‘watch’, and the number 50 was added because the Kuwait parliament consists of fifty representatives. The project evolved from an offline paper booklet into an online platform that has been gaining in traffic ever since. The number of visitors peaks to about 1,000 a day whenever an election campaign is on or a major controversy comes to light. Raqib50’s founders were quite surprised at a few things after the launch of the project. For instance, politicians weren’t angry – they were rather excited. “Some of them really didn’t care, but they woke up around elections, sending us feedback and emails with congratulations” said Alkhonaini. When it comes to the plans for 2018, Raqib50’s Alkhonaini stays firm on the ground. A month ago, they added a feature allowing the tracking the day-to-day actions of members of the Kuwaiti government. That said, a lot of work still needs to be done. The main priority for Raqib50, as Alkhonaini told us, is to be up-to-date. They would like to automate the amount of manual work they need to perform – they usually get scanned papers rather than computer-friendly digital files. Despite all the hurdles along the way, Alkhonaini spurred a major change in how politics is done in Kuwait. Some MPs started to report their parliamentary activity on their own websites. “They now publish monthly reports: how they voted, what regulation they were working on and so on. I strongly believe it wouldn’t have started without Raqib50. It was a kind of a snowball for Kuwait” said Alkhonaini.